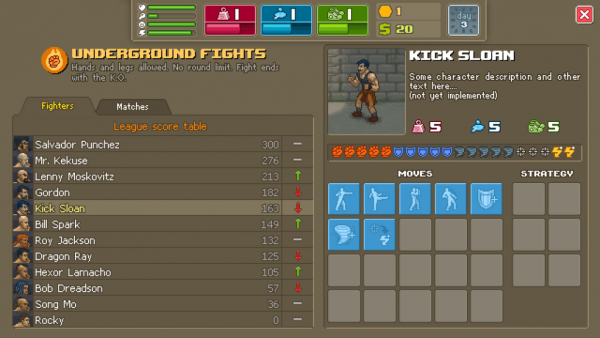 Punch Club has taken steam and twitch by storm, and it is only about a week old. I couldn’t figure out what was so good about this game. From the outside looking in, it just looked like another simulation game, but boy was I wrong. Punch Club did something that many other simulator games couldn’t do for me. It actually made me want to play it. This is also the reason I didn’t post anything yesterday. Once I started playing it, I was not able to pull myself away from the game until I saw the ending of it and oh man.We will get into that in a little. At its core, Punch Club is more about choosing your own path. You can be a righteous person and do things by the books, or you can go down the beaten path and, in my opinion, do wrong by your father. This next part is going to get a little spoiler-y so just know, if you have yet to play or watch the game be played, this might spoil the story. The game opens up with a young man with two kids. The young man trains and trains since he is a boxer. While out one night, he is shot and killed leaving his two kids behind. One kid grows up and ends up wanting to become a boxer just like his father. That is where you come it, and where your journey starts. You meet an older man named Mick. Mick says he can help you achieve your goal of getting revenge on your fathers killer, but to do so, you need to prove yourself as a champion. Your first long term goal is to become the champion of the rookie league, and this is no small feat. Once you beat the rookie league, Mick gives you this magical medallion that belonged to your father, but he only has half. Now, depending on what story line you took, this could go one of two ways. The way I took was the righteous way, at least in my eyes. You go to this mob don and tell him you want your fathers medallion. He says he will give you a chance to fight his number one fighter to win it, but you end up breaking your leg on the way home, so your buddy Roy ends up fighting for you, but doesn’t do so well and ends up dying. Seeking revenge for both your father, and Roy now, you fly to Russia to fight the man who still has the other half of the medallion. Now with both half’s, you fly back home, only to become the world champion fighter to get an invitation to the man in blacks competition he has every 4 years. After getting invitee, you fly to the island, fight sub zero and learn that the man in black is actually your dad. Roll credits. Between the cost of working out in the gym and food to keep your energy up you end up going crazy. Not to mention that every day you work out, you lose progress at the end of the day, so if you don’t train everything a minimum amount, you end up losing progress, which is kind of annoying, but after a while, you gain this sixth sense on how much you should train if you don’t want to lose progress. The money grind early game also kind of irks me. When you first start out, your only available work pays you $50 each time you complete your job, but with the gym costing $10 to enter every time you go in, not every day. I would understand if they charged you every day, but no. you can walk in the gym and pay the $10, walk right out, and then have to pay another $10 to get back in seconds later, kind of annoying, but manageable. If you decide to train at home because it would be cheaper, you might want to rethink that. The training equipment cost upwards of $200 for each piece. Towards the end of the game, I found money wasn’t really an issue though. Early on, you are going to have to decide what kind of fighter you are going to want to be, so It is strongly suggested that you have a look through the skill tree first and see what kind of build you want to do. Personally, I went with the brute force “Punching” build. I didn’t have a problem taking hits or giving hits. I did find myself running out of energy quickly depending on who I was going up against though. 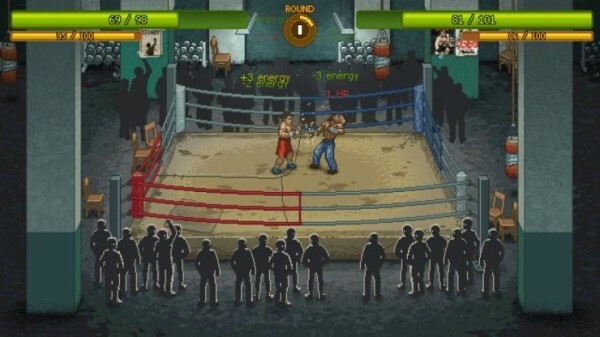 Punch Club is one of those rare games that actually got me in the mind set of “What can I equip to do the most amount of damage in the least amount of time” while simultaneously thinking “I know this is all RNG based, but there has to be that magical combo.” There were time I got up out of my chair and started screaming at my computer screen as if I were watching a real boxing match. At the end of the day, it is all about you. You can either become a world famous boxer, or you can be a bum and go to jail. The choice is yours. What will you do? If you are interested in the game, you can pick it up here on the PC. I highly suggest giving it a try. I would have to rate it an 8/10. If the devs follow up with a Punch Club 2 or something, this might be the best indie series of 2015. Only time will tell.